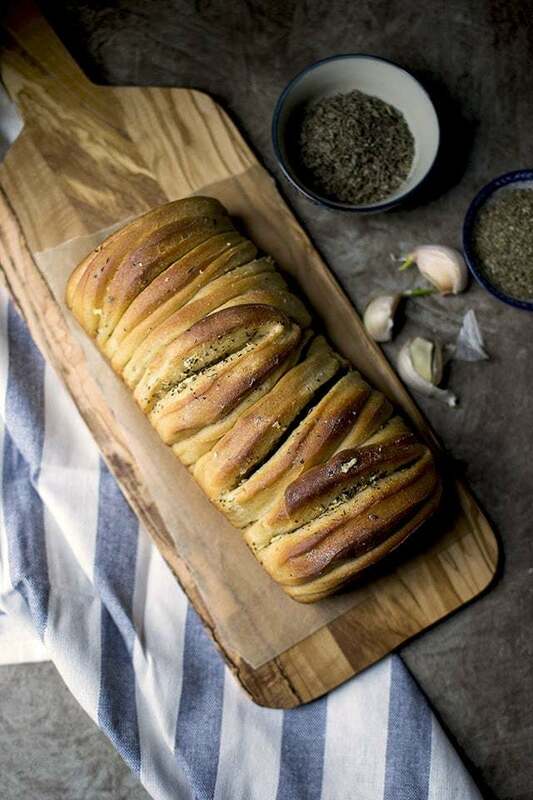 Recipe to make soft, flaky and buttery Pull apart bread with garlic butter. Serve it warm for a delicious snack. Make the dough: In a large bowl or the bowl of a stand mixer, pour the warm milk over butter to melt it. Add the sugar, salt and let it cool slightly. Then add egg (egg replacer mixture), potato flour, yeast and the flour(s). Mix and knead to form a soft and pliable dough. Place the dough in a lightly greased bowl, cover and let rise for 1 hour or until doubled in volume. Make the Garlic spread: Combine all the ingredients for the garlic spread, keep ready. Gently deflate the dough and roll the dough ½" thick. Using a 3½"~4" round cutter, cut out circles from the dough. Butter half of each circle and place in a greased 8½"x4½" loaf pan. Cover with greased plastic wrap and let rise for 30~40 minutes. Preheat the oven to 350°F. Bake the bread for 25~30 minutes. Remove from the pan and let cool before serving.